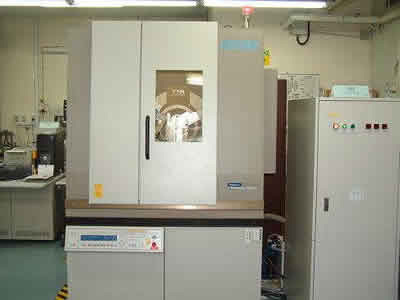 [X-ray diffractometer] Daido Bunseki Research Inc. Principle When irradiating an analysis sample with the X-ray of a specified wavelength, X-rays scattered by the atomic and molecular arrangement of the substance will have a unique diffraction pattern. The substance's structural components can be distinguished by the pattern that appears. Goniometer 2 measuring range: 0 to 154 deg.